I’ve not used this ink – but dang – I need to! Have you tried it and loved it? Please don’t say if you hated it..haha..I want to love it! 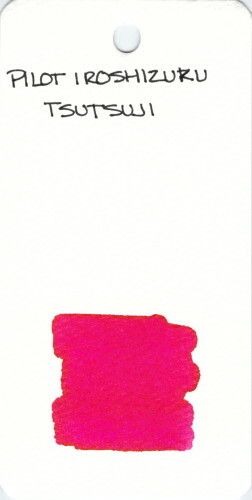 This entry was posted in INKS and tagged ink swab, pilot iroshizuku, pink by Christine (Pentulant). Bookmark the permalink. I like this ink for a short time. Then i want red. Good colour though. I have a fresh fill of it in my semi-flex Platinum Cool. I’ll have to do some testing to that effect! Seriously in my top 10 fave inks (almost definitely top 5 but I haven’t tried all the inks out there yet so I don’t want to limit myself. ^_^ ) It’s bright but deep (saturated) and complex (unusual for a pink) and just a great colour all around. Much blue-r (or more of a pure CMYK magenta) than Kosumosu which leans towards salmon/yellow end of things. Plus did I mention the golden green sheen?